More vacation photos. It was such a grand time and I have so many impressions and there was just no time to blog about everything so, here we are, some two and a half months removed, and I still have a lot to post. I have all my BlizzCon/Disneyland photos in a folder and I go through them to see what is worth blogging. 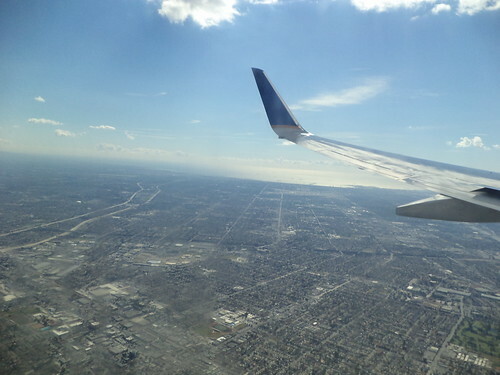 I took a lot of photos from the airplane window. It was clear both going to and coming from Los Angeles. I love looking at the ground from the air. There is so much diversity and difference in our country. It almost takes an airplane flight to appreciate the change from the lush and green Midwest to the tan of the Great Plains to the Rocky Mountains with snow to Los Angeles. But, because there is no giant line on the ground delineating where one state ends and another begins, I sort of have to guess that we might be flying over Kansas at the moment or maybe this is western Colorado. The photos, while interesting to me, aren't going to be interesting to anyone else. So, I've decided to go with a "first look" theme. I can say something about those photos. Wednesday, November 4th, was a travel day. I got up at 5 a.m., showered and finished packing. The limo to the airport would pick me up by 6:45. I wanted to be completely ready. I had cats to reassure and feed and one last swing through the house to make sure it was reasonably clean. I hate coming home to a dirty house. I set my luggage on the sidewalk in front of the steps. I saw a limo drive down the street, go to the next intersection and turn around. When I got back to the front door, the driver had parked and claimed my luggage. One last chin and ear scratch with a promise I'd be back soon, and I left. It was foggy. Sometimes I think I should print this or have it made into a print. 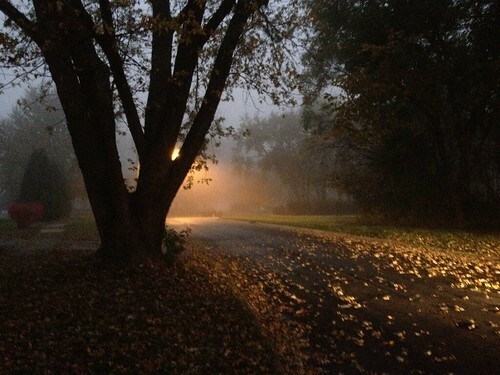 It was an accidental photo taken more to document that it was a) fall in Illinois, b) foggy and c) before sunrise. Generally, I don't try for an arty photo. My photos are to document things. When something like the above happens, I'm quite surprised. It looked okay on my phone, just what I needed. My flight left at 9:45. I got to the airport at 7:30, owing to the limo being at the house at 6:25 and me ready to go. Thanks to an app, I had curbside check-in of my luggage and a boarding pass all ready. The guy at curbside checked all my paperwork and pointed me in the direction of the security line. Yeah...about that. There are debates and debates about whether this makes us safer. When you have something like RA, standing in lines like this can be tough. Three years ago, this would have been a nightmare for me. I found, at the end of the day on Sunday, November 8th, when we were waiting for the evening light show and the security personnel from Disney were telling everyone to stand, it was too much. I had to sit down, irrespective of calls to stand up. It's about knowing your limits. Here, it was early morning. I hadn't had a whole day to be on my feet and the line was moving, albeit slowly, but it was moving. The one thing I don't "get" is the person who has a 7:45 flight, arriving at the airport at 7:30 and expecting to make said flight when the security line is this long. There was one guy walking this middle row, calling out flight times and then pulling people for special fast screening. But after this was the metal detectors and there was a line for that. I cannot imagine those people made their flights. Some comments from people around me were quite "colorful" in their opinion of folks who seem to think they can just run up to the gate. Those days are 15 years behind us. I wasn't happy that the limo company said 6:45 for pick-up, but I see why. And TSA people, when you finally got to the screening point, were shouting that there would be more restrictive screening upcoming "for the holidays". Once I got through all that, I found the gate and got breakfast. As early as I was, there were empty seats near the windows. Airports are fascinating places, akin to hives. Planes are the worker drones who bring their cargo, passengers, to the hive. On this day, the hive was slightly obscured by fog. Had this been a clear day, you would have seen the Chicago skyline. As it was, sky and ground merged. 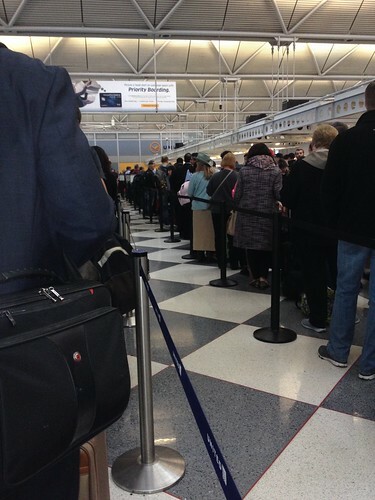 The backlash of a foggy day in Chicago is the delays across the country as planes have to land in a slow fashion. My flight wasn't delayed getting out, but others were because their planes were stuck flying circles over Memphis while waiting for permission to proceed north. I thought the seats next to me would stay empty but the couple who finally occupied them made it on at the last minute. 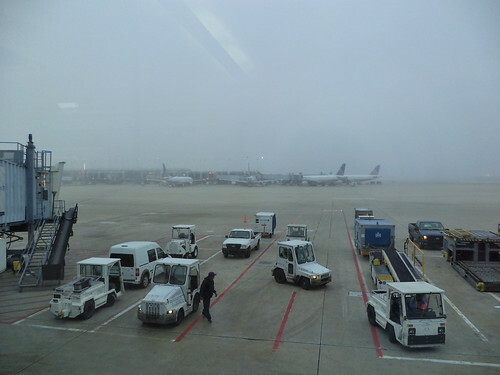 They were coming from Traverse City, Michigan, and had been delayed because of the fog in Chicago. Every seat was filled. 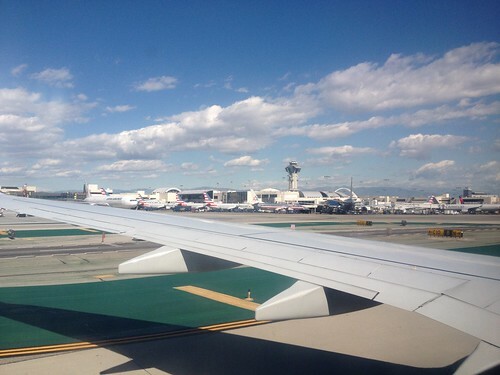 It's a 4 hour flight to LA, give or take a new minutes depending upon the weather. I took a nap and read. I packed a Discworld book and wound up coming within 50 pages of finishing it on the flight back. After my nap, I had no idea where we were. The ground was brownish green. There were foothills and eventually, towns merging into one another. The pilot informed us we were 30 minutes from arrival. I looked up. In the distance, the sun glinted off the Pacific Ocean. I'm here. Excitement started building. 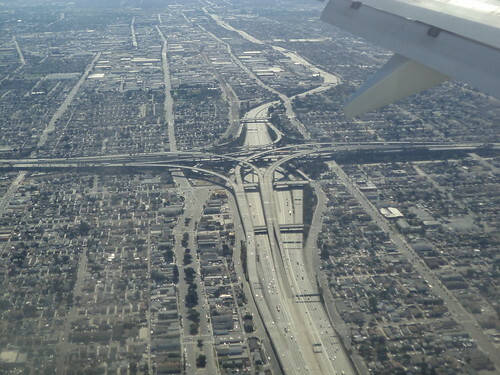 We flew over some of LA's Interstates. I have an aunt in Pasadena. I haven't seen her in decades, other than photos on Facebook. I tried to arrange my schedule so there was time to visit, but I would have had to rent a car and drive to and from some point. When we flew over this interchange, I could feel anxiety rising. Generally speaking, give me a map and I can find anything. But I looked at this and decided I was very grateful I opted not to rent a car and try to drive. If I lived out here, eventually, I'd probably have to navigate this, but I'm just a tourist and I know how I feel about tourists who suddenly discover they have to be in the right lane to go south on the Dan Ryan and they are in the far left lane headed into Chicago. I made the right decision. Terror is never a good passenger. Hello LA! Hello Disneyland! Hello BlizzCon 2015! I have arrived. With signs and people from whom to get directions, I found my luggage and got to the SuperShuttle. The Shuttle was filled and everyone was going to BlizzCon. The guy in the far back was from Germany and was staying at the flagship hotel, the Hilton. I was the last passenger picked up so I got to ride in the front. Car pool lanes. We don't have those in Chicago. And there are four lanes of traffic in addition to the car pool lanes. My feeling of "I can drive anywhere" faded very quickly. Nope; a big nope. The only palm trees we have are in the Garfield Park conservatory. Yeah, this landscape is a bit different than a leaf-shedding maple on a quiet street in Wheaton, Illinois. 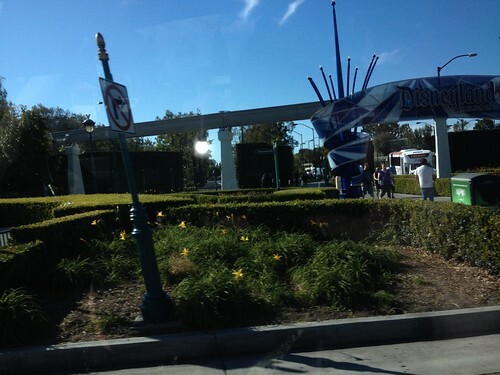 We drove past the entry to Disneyland. I grew up on The Wonderful World of Disney. I remember some programs which gave you a tour of Disneyland. It seemed like such a far-off place and here I was, going right by it. I would be there the next day, with avowed "Disney freak", Liz. Even though I was passing it, it didn't seem real. We went 6 blocks south and made a right turn. 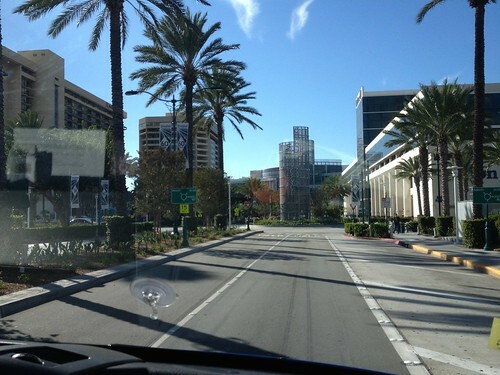 The Anaheim Convention Center loomed into view. You can't see from this distance, but it's festooned with all things Blizzard. Ive seen photos of the convention center with the banners but here it was. It didn't seem real. Everyone in the shuttle got quiet. We were all first time attendees and I think it had now dawned on all of us that we were, in fact, at BlizzCon. I didn't say a word other than "Have fun. Nice to ride with you." as the others disembarked at their respective hotels. I was the last person to be dropped off. After getting to the hotel room, I sat down and looked at the photo of the convention center. All the planning and saving. I really was here. I had seen the convention center with my own eyes. 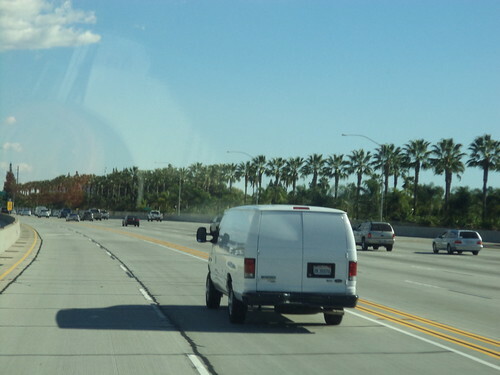 So this is Southern California, Disneyland and Anaheim. This was going to be an amazing 4 days. I'm with you,no way I would drive there either!